BBC’s launch of BBC One HD in the UK is marked by “Never Looked So Good”, a 60 second TV advert showcasing a world of fun BBC One content in heightened reality, tongue in cheek glamour and slo-mo camera work. 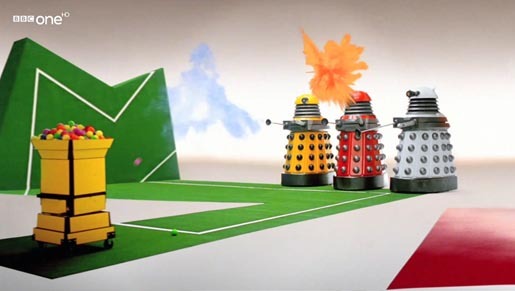 The commercial features appearances from Lord Sugar, Tess Daly, Bruce Forsyth, the new paradigm Daleks and many other BBC household names. The launch campaign was developed at RKCR by creative director Mark Roalfe, copywriter Kim Hutcheson, art director Joe Fitzgerald, planner Emily James, account director David Pomfret, account manager Charlie Smith, working with BBC One head of marketing Reemah Sakaan and marketing manager Aoife Liyanage. Filming was shot by director Julien Lutz via Red Bee Media with producer Sarah Caddy. Post production was done at The Moving Picture Company, London. Audio post production was done at Factory Studios. Music is “I Won’t Kneel”, a track by Groove Armada. In order of appearance, BBC One stars in the ad are Dot Cotton, Lee Mack, Jake Humphrey, Shane Ritchie, Tess Daly, Ola Jordan, Brendance Cole, Bruce Forsyth, Len Goodman, Fiona Bruce, Hugh Quarshie, Lord Sugar, Karen Brady, Nick Hewer, Alex Jones.